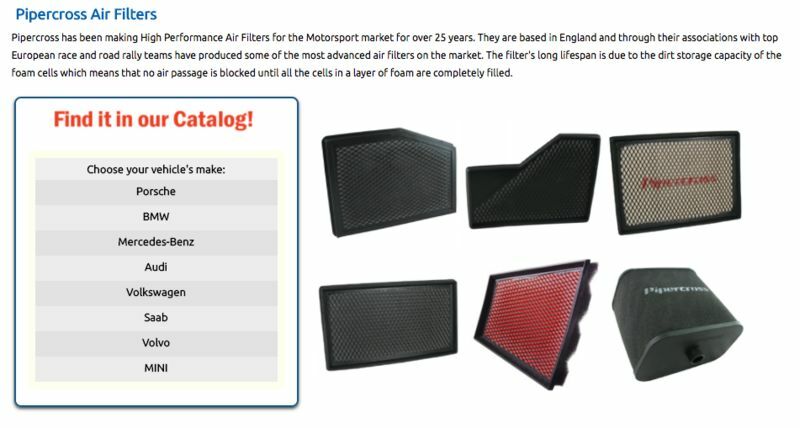 Pipercross has been making High Performance Air Filters for the Motorsport market for over 25 years. They're associated with European race and road rally teams and have produced some of the most advanced air filters on the market. The filter's long lifespan is due to the dirt storage capacity of the foam cells which means that no air passage is blocked until all the cells in a layer of foam are completely filled. Interesting. How do these compare to K&N or other oiled filters? They are marketed as performance; what does that mean? Increased HP? if so, how much? What does long lifespan mean? How long in terms of months, years do they last? Is there a difference in sound compared to cold air intakes? A Pipercross panel filter will provide the simplest, most effective entry point into the range and fully utilizes the Pipercross layered multi-density foam technology and lifetime construction. They're lifetime in that they're washable. They also claim that you should see an improvement in fuel economy and provide about 30% more flow than OEM panels. You might want to link it in your first post. Last edited by particlewave; 08-08-2017 at 06:51 PM. No, that link just goes to the product information page. I was pointing out that it would be nice if you posted links to the actual product purchase pages so that potential customers don't have to search and scroll through a catalog to find them for purchase. I appreciate your input. It's more than a product information page. That page was built specifically to make the search easier for people as once you input your vehicle information in the box to the left it brings you straight to Pipercross product in the catalog that is made for your vehicle application. This is easier than inputting your vehicle info at Pelican Parts.com and then clicking on "Fuel & Intake" and then clicking on "Air Filters" and then scrolling through all that we offer. Last edited by Luccia at Pelican Parts; 08-09-2017 at 10:30 AM. What "box to the left"? The "Find it in Our Catalog" box/icon does nothing. That is strange. What internet browser are you using? This is what you should see.